January saw the redeployment of Australian troops, who had been evacuated from Gallipoli before Christmas, and a renewed focus on the Western European theatre of war. The summer of 1916 would once again see Australian troops engaged in battles that would become synonymous with sacrifice and the ANZAC spirit. These included the Battles of Fromelles at the end of July and the Somme, which would last from the 1 July until the 18 November, with Australians engaged at Pozieres and Mouquet Farm. The heavy Australian losses on the Western Front should not, however, detract from Australian service in the Middle Eastern theatre. In the deserts of Egypt, this included the Battle of Romani at the beginning of August, which was the culmination of sustained struggles between the Entente and the Ottoman empire over control of the Suez Canal. Working parties of the 22nd Battalion digging defence line trenches at 'Hogsback,' near Ismailia, Egypt, in January 1916. AWM C02442. On the home front, 1916 was a year of firsts. The first ANZAC Day was commemorated on 25 April, and the first conscription referendum, held on 28 October, would be defeated by the narrowest of margins, 49 to 51 against. The heavy Australian casualties of 1916 that necessitated conscription were the very ones that contributed to dwindling volunteer numbers and made just over half of Australians reluctant to send more men to the front. 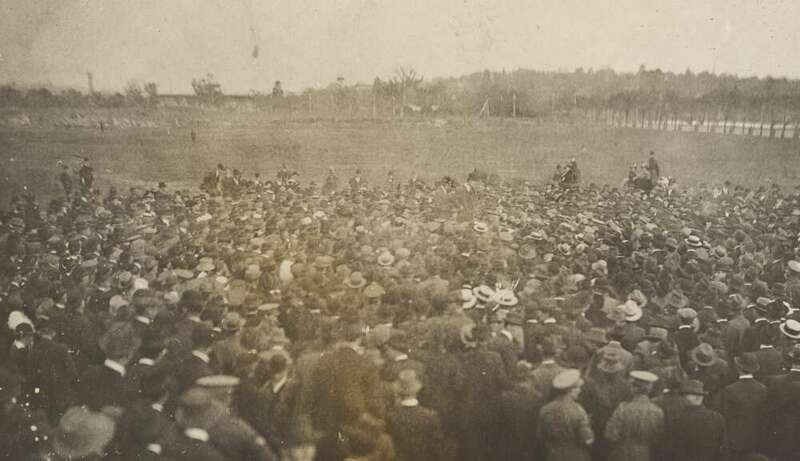 Anti-conscription meeting Yarra Bank Sunday 16 April 1916. National Library of Australia 6487142.